Norton was six of seven from outside, making all of the Bulldogs three-pointers during the game and had three straight in the first half to give Truman their first double-digit lead at 29-17. S&T clawed back to within one point on a basket by Linda Pagrode to make it 34-33 but free throws by Allison Wiese and Ashley Hartwig extended the Truman lead to 38-33 at the break. The margin was one again early in the second but Norton dialed three to spark a 6-0 burst. Hartwig, who finished with 13 points and a team-high nine rebounds, had a conventional three-point play with 6:29 left to put the game into double-figures for good. The Lady Miners scored seven points in the final seven minutes while Truman tallied 20 to win going away. Norton was 7-of-9 from the field with three boards and a pair of assists for 22. Michalina Tomczak added 15 with three blocks to join Hartwig in double-digits. 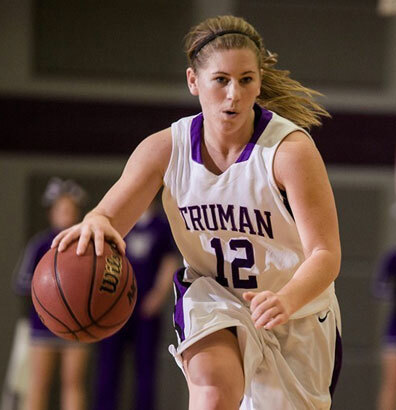 Truman shot 42% for the game and converted on 20-of-24 free throw attempts. Brittany Andersen was the only Lady Miner in double figures with 11 points. The Bulldogs will take the trip to Louisville, Kentucky on Thursday night to face Bellarmine at 4:45 p.m. central time.